I have done writing in other fields, having produced book and theatre reviews for a variety of publications from Gay News to Scottish Field. For several years, in the early 1990s, I had my own theatre column, Bunyan’s London, in the Scandinavian magazine Reporter. In the summer of 1983, between Just Good Friends and Homes and Gardens, I was asked to write a few songs for Clive Barker’s play Subtle Bodies at the Cockpit theatre. These were performed onstage by Vivian Corringham with myself at keyboard. Clive has, of course, gone on to be better known as one of the most successful horror writers in the world, his Books Of Blood having come out a year after the run of Subtle Bodies. 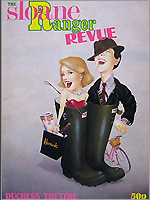 In the 1980s I realised a West End writing credit with a short sketch in the short-lived Sloane Ranger Revue which moved from Windsor into the Duchess Theatre. 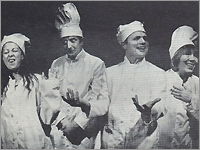 My sketch, A Piece Of Cake, was immaculately performed by Gaye Brown and, along with a sketch by Stephen Fry and Hugh Laurie, was singled out for particular praise by the reviews. Around the same time I got to contribute to Maggie Steed’s monologue as Victoria Gillick in The Pretty Policeman’s Ball. In 1986, there was also a commission to write an episode of the BBC children’s television series, Up Our Street. My piece, The End of The Line, was an update of the Jack Spratt rhyme with a cast featuring Alexandra Mathie, Jo Warne, Brian Jamieson, Delia Morgan and Nick Wilton. In a break from musical theatre I tried my hand at several plays, one of which won what is now the International Playwriting Competition run by the Warehouse Theatre Croydon. The prize for the competition was a rehearsed reading of the play, directed by Celia Bannerman with Richard Bates, Pamela Moiseiwitsch, Jan Ravens and Simon Slater as the cast. 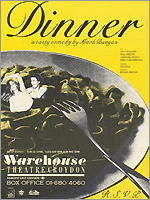 Following the success of this reading, Dinner, was produced for a very successful three week run at the theatre in spring 1989. It was directed by Ted Craig, designed by Michael Pavelka, and Pamela Moiseiwitsch was this time joined by Sally Faulkner, Jonathan Hackett and Paul Gregory. The production was chosen for the recommended list of What’s On In London.